Before we begin, please scroll down for forecasts of the tornadoes/severe thunderstorms risk for tomorrow. Orange is a blizzard warning (includes Denver). 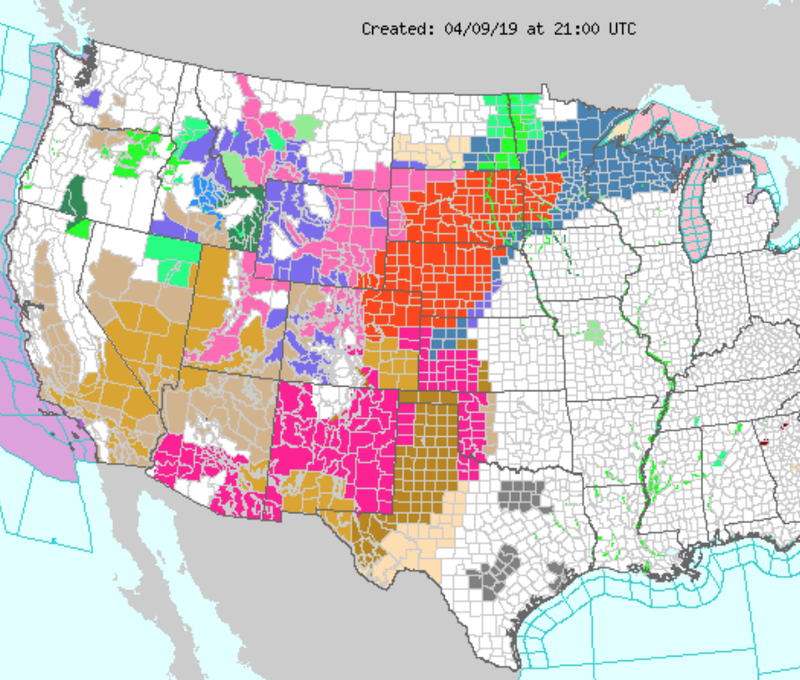 Pink is winter storm warnings. 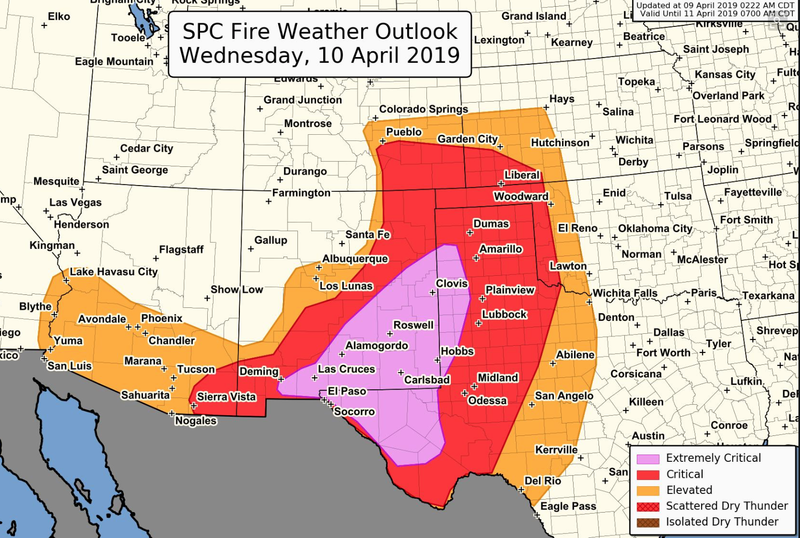 Magenta is "red flag" (wildfire) warnings. Brown is high wind warnings. Dark blue is a winter storm watch. Greens are various flood warnings and advisories. 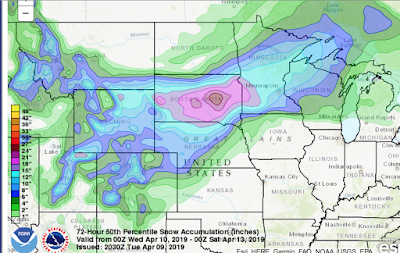 The accumulation forecasts for this storm are complicated by the relative warm ground moving into mid-April along with the high sun angle. 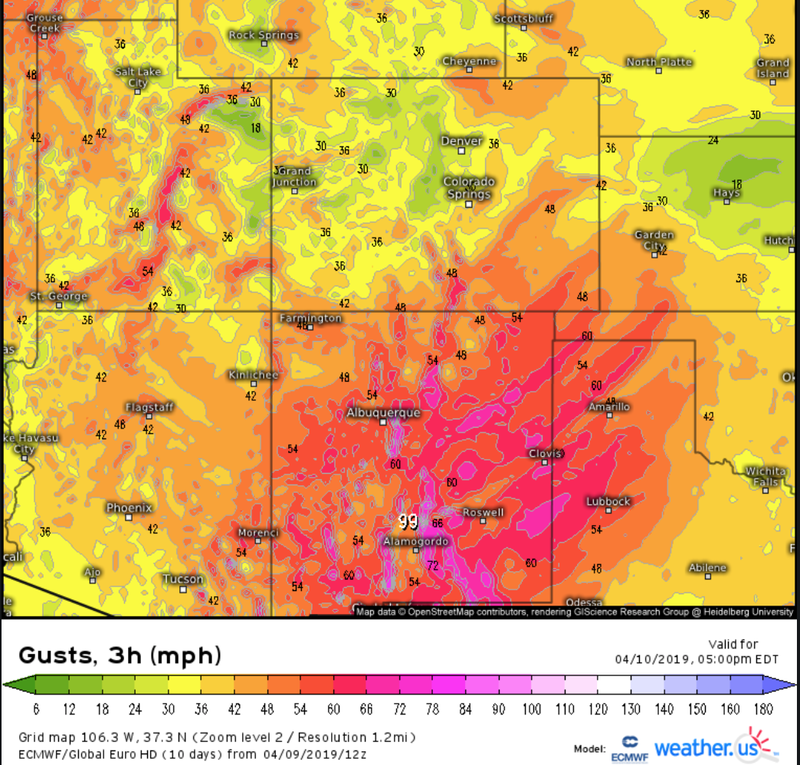 Winds will frequently gust above 40 mph with a few gusts above 50 mph. 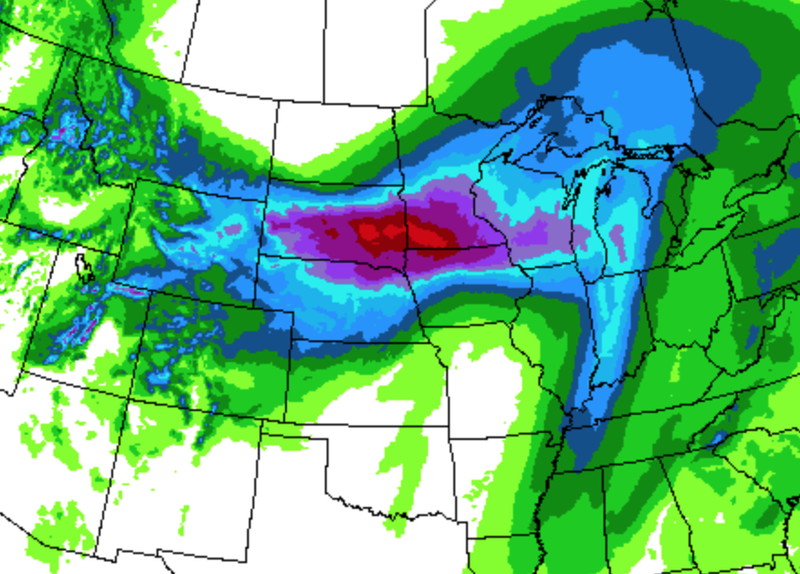 Please factor this forecast into your travel plans. There is a likelihood of power failures, worse than with the March storm, because trees are leafing out. There is also the potential for major livestock losses in the region. Note: If you are planning to fly to/from/through Denver International Airport Wednesday or Thursday, please see if you can be re-routed. Also, be prepared for moderate to severe turbulence if you are flying a route (e.g., Oklahoma City to Minneapolis) that will fly above the blizzard area. The above map is in knots, so multiply the peak gust values by 1.15 to get the value in miles per hour. Note the extreme winds with the snow in Minnesota and South Dakota. This map is in miles per hour. 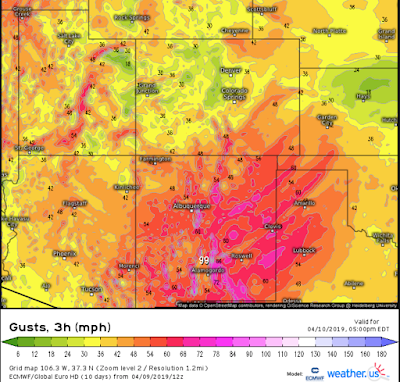 Yes, that is a 99 mph gust near Alamagordo, NM. Here is the precipitation for the last seven days. 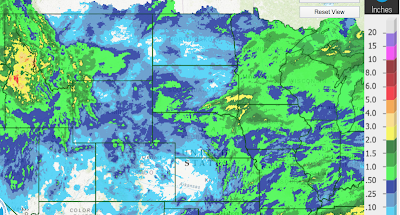 The map below is the forecast precipitation (rain and melted snow) for the next three days. 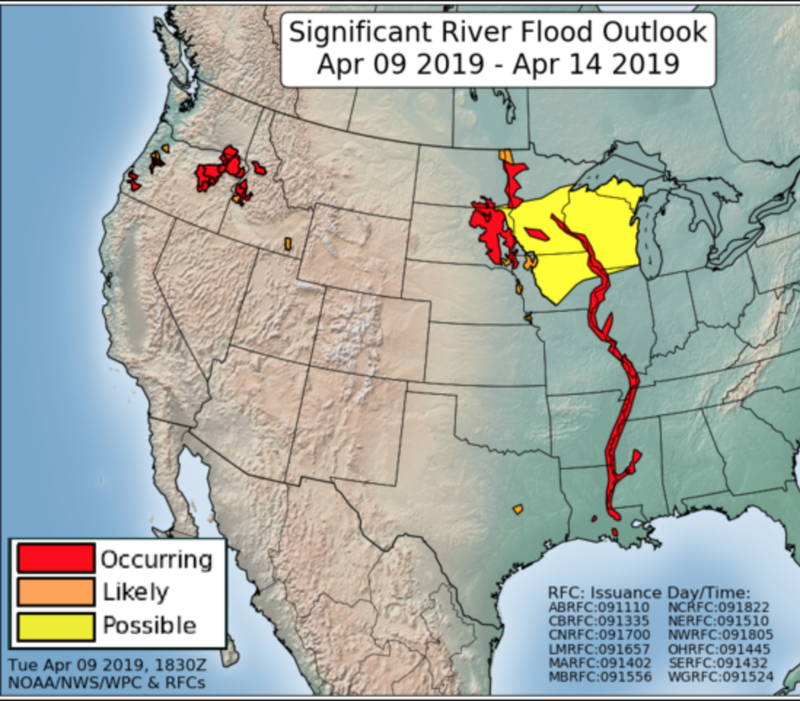 This means that the effective 10-day precipitation in some areas will be five inches or more -- enough to cause rivers to resume their rises. 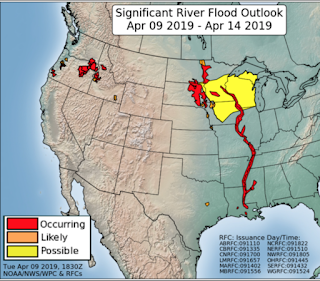 Please see map below for a graphic presentation. 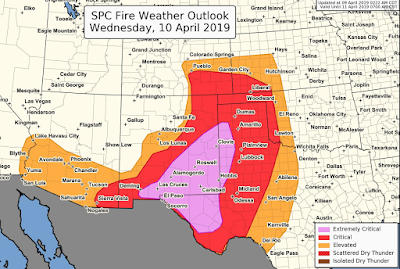 The purple area has an "extremely critical" (the most serious category) risk of wildfires. Please use extra care tomorrow to keep them from igniting. 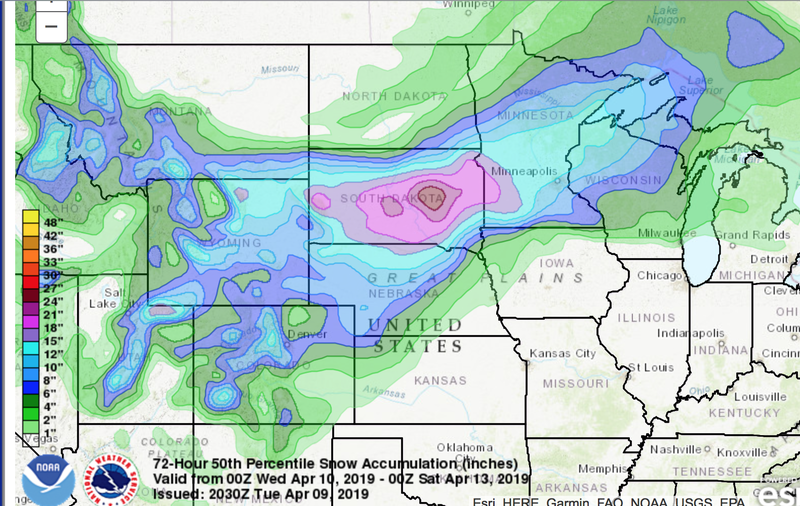 Editorial comment: A quarter-century ago, this type of comprehensive forecast (blizzard, flood, wildfires, etc.) would have been impossible. These reliable forecasts are made possible by advances in weather science and the hard work of meteorologists.